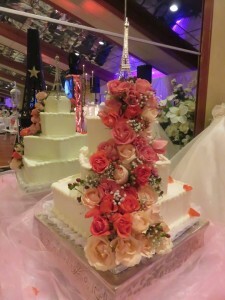 The extravagant occasion included a pink and white color scheme, large Eiffel Tower and a three-tier cake decked in flowers. 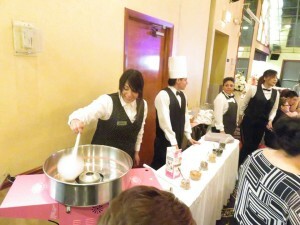 Not to be outdone, sweet fifteen also included a cotton candy station and decadent chocolate fountain. 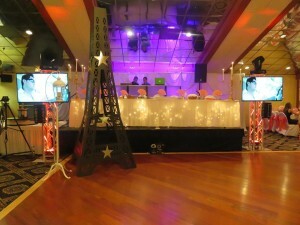 Another way that the Martinique can help personalize your cotillion is through one of our packages. Depending upon when you are looking to host your event, we offer different options, including the Quinceañera de Primavera and Quinceañera de Invierno. Packages include a family style of combination option, open bar with Modelo on draft, décor and more. Stop in to meet with Miguel to plan a beautiful and memorable Quinceañera. To set up an appointment, you can call our office at 708-424-1776 or email info@martiniquebanquets.com. We can provide a tour of our Grand Ballroom and Celebrity Ballroom and discuss our Cotillion packages in more detail. For photos and ideas, visit our Facebook page. This entry was posted in Blog, Quinceañera and tagged chicago quince, Cotillion, paris themed event, Quinceañera, sweet 15, sweet fifteen by admin. Bookmark the permalink.